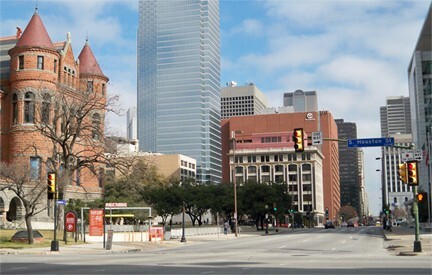 Originally US 75 came into Dallas on Ross Avenue, then turned south on Lamar Street. US 77 came in via Maple Avenue, jogged a few times, and ended up on Lamar. It met US 75 at Ross, so it could have ended at that intersection. But it is more likely that US 77 would have overlapped with US 75 down Lamar to Commerce Street. At that point it left US 75 and joined westbound US 80, ending at the courthouse on Houston Street. ​Meanwhile, US 67 came in on Gaston Avenue, which becomes Pacific Avenue downtown. 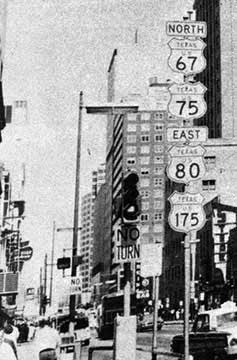 That junctioned with US 75 at Lamar (a block or two from the US 75-77 junction), so US 67 could have ended there. But again, it is more likely that US 67 was co-signed south with US 75-77 to Commerce, then west to a common terminus with US 77.
c. 1930s, "Dallas Then and Now"
That was also looking east on Commerce; the angle to the right is southeast on 2nd (where US 175 split off). 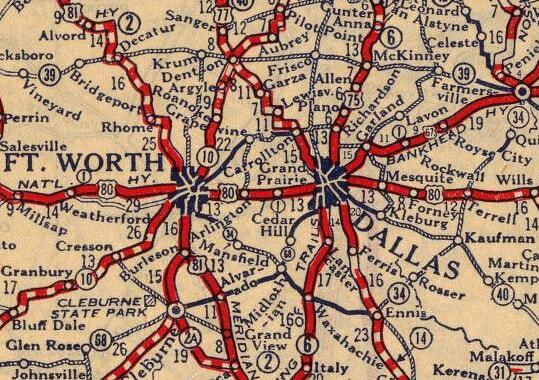 US 175 still ends in Dallas, but no longer makes it into the downtown area. US 67 and US 77 did not end in Dallas for long; for decades they have each been serving Mexico border crossings. last updated Dec. 2, 2016.